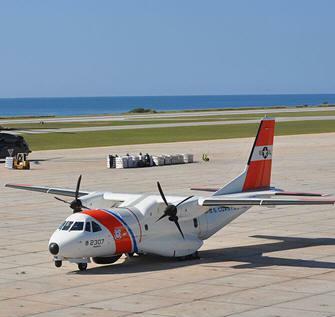 April 7, 2012 - The U.S. Coast Guard exercised a $78.54 million contract option Wednesday to purchase the service’s 16th and 17th HC-144 Ocean Sentry maritime patrol airplane from EADS North America. Even before the Coast Guard formally accepted the first Mission Systems Pallet, which provides enhanced sensors and communications equipment, for the Ocean Sentries in March 2008, the HC-144 was already proving its value and capability. The airplane conducted its first search and rescue mission in February 2008, when the aircraft and crew oversaw search efforts following the collision of two U.S. Air Force F-15C fighter jets over the Gulf of Mexico. Although still undergoing integration and operational testing at the time, the Ocean Sentry’s mission system collected Automatic Identification System data, which in turn helped identify and communicate with civilian vessels in the area of the crash, including a good Samaritan vessel that was vectored to help locate the downed airmen. The Ocean Sentry’s sensor array and C4ISR (command, control, communications, computers, intelligence, surveillance and reconnaissance) capabilities provided real-time situational awareness of conditions in Haiti following the 7.0 magnitude earthquake that devastated the island-nation in January 2010. The Ocean Sentry’s Mission System Pallet, a roll-on, roll-off suite of electronic equipment, allows for superior collection, interpretation and dissemination of data from the aircraft’s multiple sensors, and the ability to transmit and receive classified and unclassified information from other aircraft, surface vessels or shore facilities. The Ocean Sentry is also equipped with an Electro-Optical/Infra-Red system and a multi-mode search radar. About 90 percent similar to the Mission System Pallets found on the Coast Guard’s HC-130Hercules airplanes, the Ocean Sentry’s Mission System Pallet allows for common training and operation. The Ocean Sentry has even assisted in the protection of living marine resources. A Mobile, Ala., based HC-144 and its crew transported 20 endangered Kemp’s Ridley sea turtles from Hanscom Air Force Base, Lincoln, Mass., to Orlando, Fla., where the turtles were rehabilitated at Sea World before being released back into the wild. The turtles had been rescued from waters near Cape Cod, Mass., and were being treated by staff and volunteers from the New England Aquarium. Since the delivery of the first Ocean Sentry, HC-144’s and crews have logged more than 26,350 flight hours, with more than 10,250 of those flown in 2011.